by Friedman, Lawrence Jacob, McGarvie, Mark D.
Comments: Used - Good May contain highlighting/underlining/notes/etc. May have used stickers on cover. Access codes and supplements are not guaranteed to be included with used books. Ships same or next day. Expedited shipping: 2-3 business days, Standard shipping: 4-14 business days. Friedman, Lawrence Jacob, McGarvie, Mark D.
Professional historians address the dominant issues and theories offered to explain the history of American philanthropy and its role in American society. 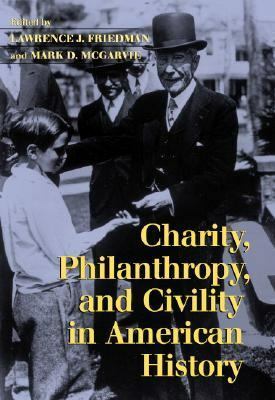 The book's premise is that philanthropic activity in America has its roots in the desires of individuals to impose their visions of societal ideals upon their society.Friedman, Lawrence Jacob is the author of 'Charity, Philanthropy, and Civility in American History' with ISBN 9780521819893 and ISBN 052181989X. Loading marketplace prices 127 copies from $15.38 How does the rental process work?